White flesh, potato like flesh once cooked (species and photo not confirmed with this description). We crossed Cotton Candy with Baby Boo in 2005 to produce an F1 (Ghost!) which was distributed through the OSP (Organic Seed Partnership) to participating organic farmers in New York State in 2006 and 2007. 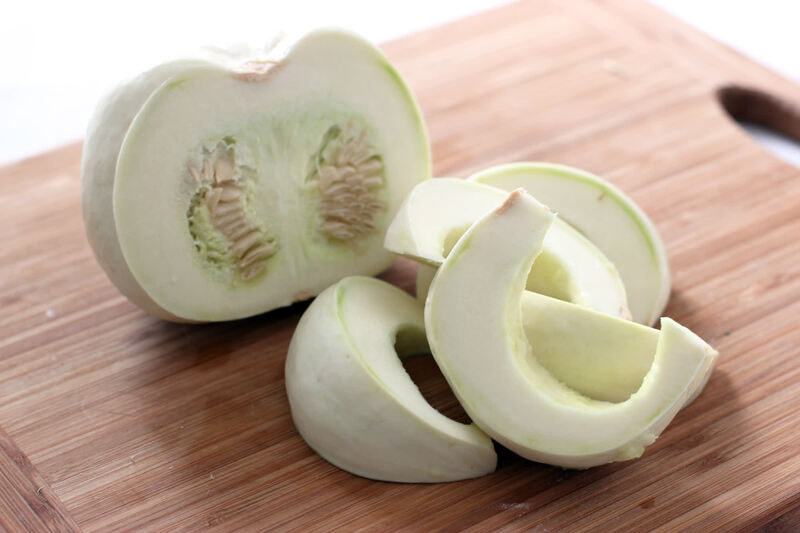 The diminuative Baby Boo, a patented Jack-Be-Little type with long lasting white skin is a popular fall decorative squash and like Cotton Candy is an open-pollinated variety (non hybrid). Cotton Candy and Baby Boo are the parents of the Ghost! tribe that is being trialed through the Organic Seed Partnership. 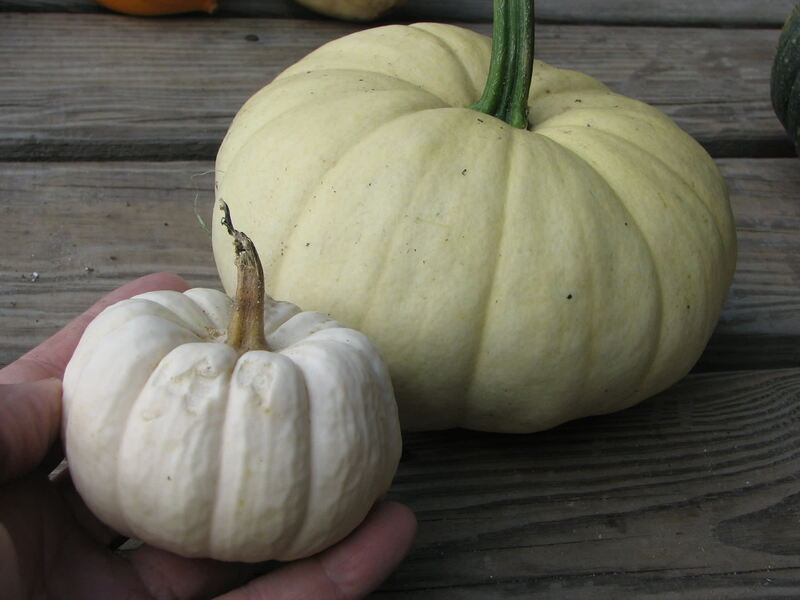 The F1 generation produced a rather squat medium sized white pumpkin which a lot of folks like. This summer the seed from the F1 generation was planted and gave rise to a diverse tribe of interesting pumpkins that I posted pictures of in an earlier rambling. Now the pumpkins have been in the field all summer and we can take a closer look at them. The F2 generation of pumpkins from Cotton Candy x Baby Boo F1 (Ghost!) have been in the field exposed to the full sun and high temperatures past their ripening period. Ghost! was a flatter Cotton Candy type which retained it's bright color better in the field. What you can see in this photo is the variation in color after prolonged sun exposure (late October). Cotton Candy will typically turn a cream or yellow unless harvested early and protected from the sun and you can see that some of the F2's show this trait to an even greater degree. Baby Boo; however, remains white and you can see that some of the F2's show that characteristic as well. Then, there are some that have turned an uncharacteristic buff-pink color. I don't know where that came from. The F2 generation (Ghost! 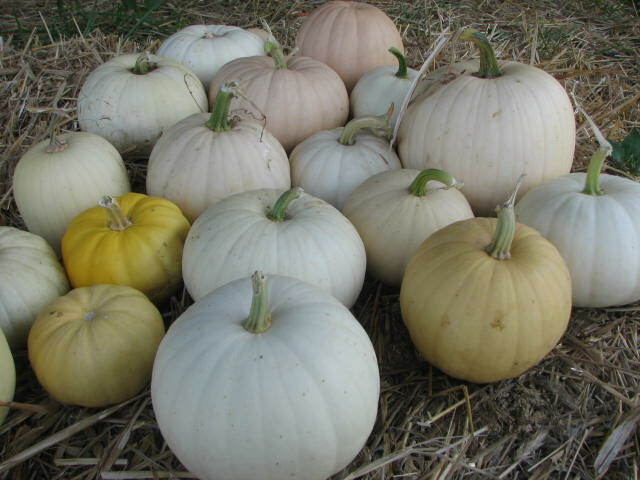 tribe) of the two "white" pepo pumpkin parents shows the degree of new genetic combinations one can expect as segregation of characters occurs.